MEMBERS of the Woking Asian Business Forum (WABF) have looked back on a successful year, with all those who have come into contact with the forum and its extended team of volunteer associates giving glowing feedback. Chairman Shahid Azeem said: “Walking around the events and overhearing members and guests sharing their concerns and best practice advice with each other is music to my ears. The list of recent guest speakers boasts an impressive line-up, having included Prince Kalabagh from Pakistan and Dr Spinder Dhaliwal from the University of Surrey on entrepreneurial spirit. Indy Lall, the F1 team manager for McLaren, Pervez Jamil (PJ) Mir, media manager for the Pakistan team during the Cricket World Cup 2007, and Mohammed Zubair, the owner of Galaxy Cars in Woking, have also spoken at the WABF. 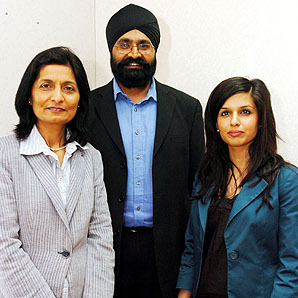 Directors of Woking Asian Business Forum. Beneficiaries have included the Surrey Care Trust, where sponsorship of a lunch in May brought together a number of successful business people to make them more aware of the work the trust does. Woking Hospice, in the form of Tania’s Summer Ball, has twice now been another partner for a successful community fundraising event. The 40ft Christmas tree in Woking Town Square was another notable achievement, with the entire Asian community wishing the town a festive season of peace and joy. Those who have attended WABF events have seen that the elusive ‘it’ is actually achievable in life because of the inspirational participants and influencers on show.